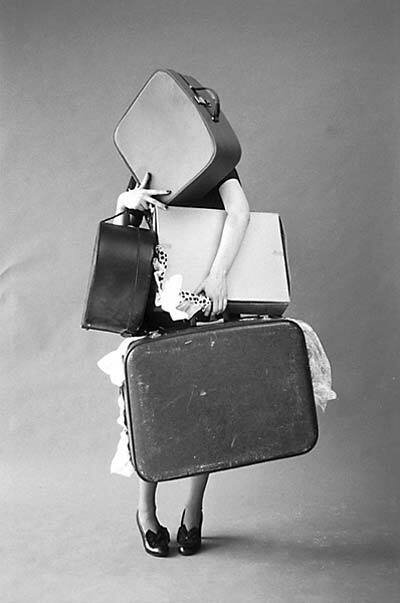 There have been a few occasions when I tried to pack light. Every time I do that, I regret it. I wish I had brought my jeans or I end up needing a nicer dress or some clothes more appropriate for an adventure. I'll wish I had warmer pajamas or a lighter skirt. And there is no accounting for what kind of mood I'll be in on any given day. There doesn't seem to be a balance when it comes to my luggage. Any tips from the people who know how to pack? Any other overpackers who understand my problem? LOL!!! I am a frequent jet setter and pack very light, you have to stand in front of your closet with a pad and pen. Begin by creating your wardrobe with pieces you can mix, match and wear more than once. But make sure no one will notice you wore it more than once:) change the top or the accessories, etc..... lastly, you have to ROLL and Tuck. oh and only a small toiletry bag missy! I always plan outfits ahead of time. This means harassing the people I will visit so that I don't get surprised, because I hate having to take more than I need. I also compulsively check the weather. I think that overpacking is a good thing too though. My wardrobe when I packed for Japan was way too scant for a year long stay. I was getting bored with my clothes much too soon. I always pack the most important pieces first. If I'm going for business, I pack a business suit or two. Then a thick and a thin jacket/jeans/shirt. And a pair of flats.I wear my thickest outfit and heels to airport to reduce luggage. If I need more clothe I have an excuse to shop locally =D. It's much easier to shop casual clothe than business suit or important outfit that HAVE to look good on you. I start with the shoes. One pair of flats and one pair of heels. I try to stick with a color theme for the trip so I don't have to worry about things matching. So I'll pack a bunch of greys and purples or maybe browns and blues. Throw in a different colored scarf or jewelry for variety. I always pack jeans, but I dump a jacket in the summer.